FROM NO TIME LIKE THE PRESENT. Learn about our PETALUMA PROJECT! 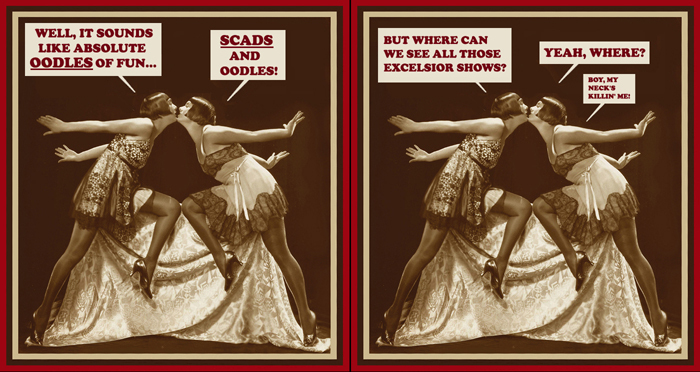 Where Can You See Excelsior Shows? 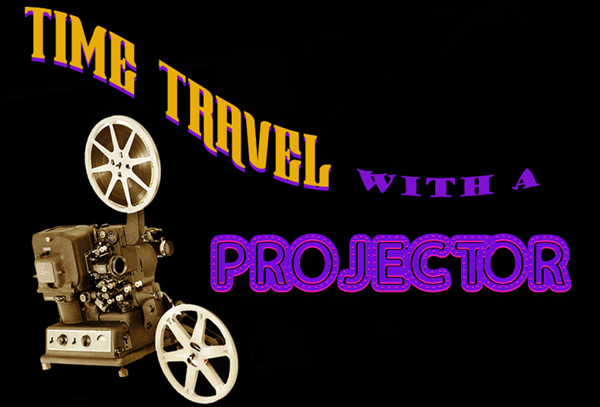 Home movies-- 16mm, 8mm, and Super-8; what a time capsule! places as they were 30, 40, 50, 60, 70, even 80 or more years ago. people or places or events you've known or known of long ago. Nostalgia, yes-- and some of them are just plain entertaining. 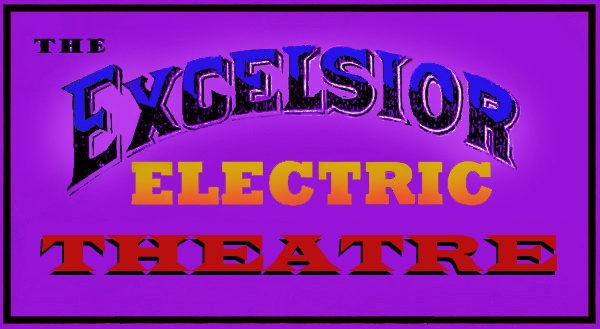 Book a show with choice picks from Excelsior's Home Movie Library. for a richly-textured silver-screen visit to the world of yesterday. 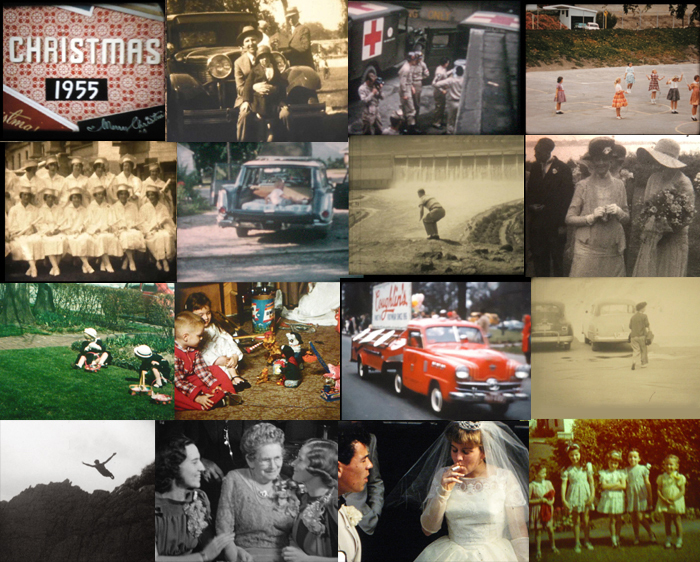 Do you have old home movies and no way to screen them? 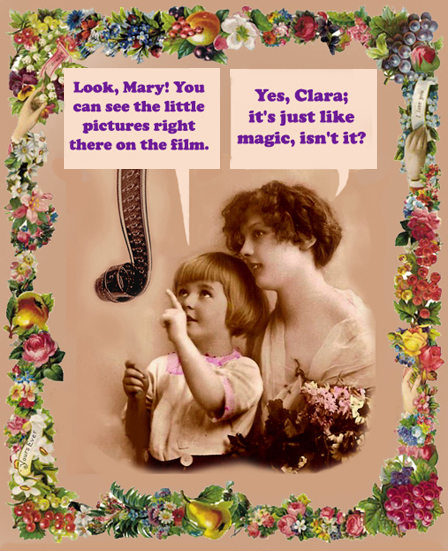 Do you have friends with old home movies? Invite them to share by having an Open Screen Party so all can see. 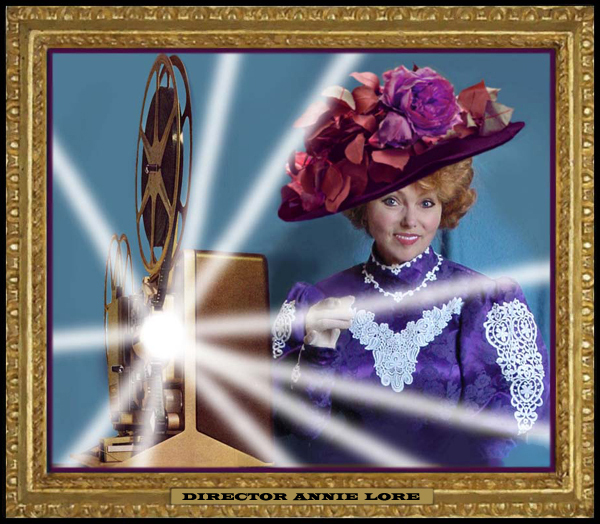 An Open Screen night or matinee is also ideal for schools and libraries. Are you planning to transfer your films to video and want a look first? Have you come upon a box of unknown reels of film and want a showing? you'd like to have screened? ready and eager to put your treasures up on the big screen. we even have them from the very decade when your movies were shot. someone's birth or wedding year can yield an especially appealing theme. or too expensive for most home movie-makers. long last for the home, student and smaller budget filmmaker. 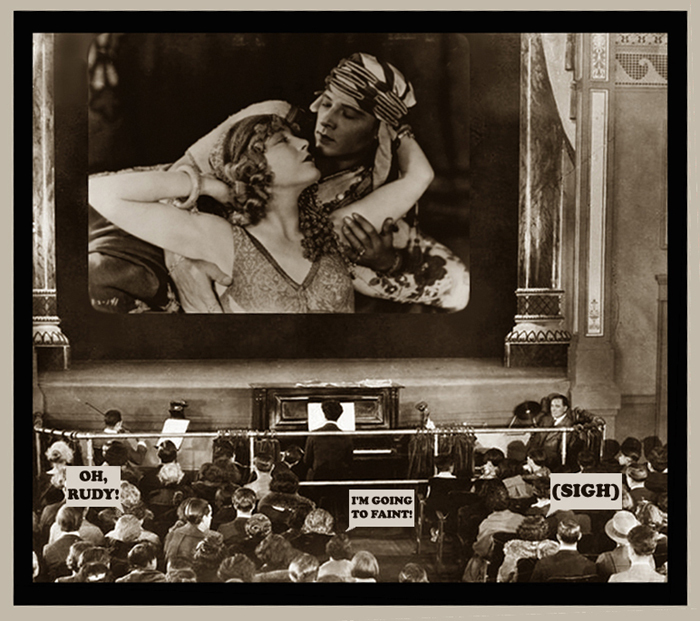 Is No Place to Watch Early 20th-Century Movies. SEE THEM IN THEIR OWN TIME! 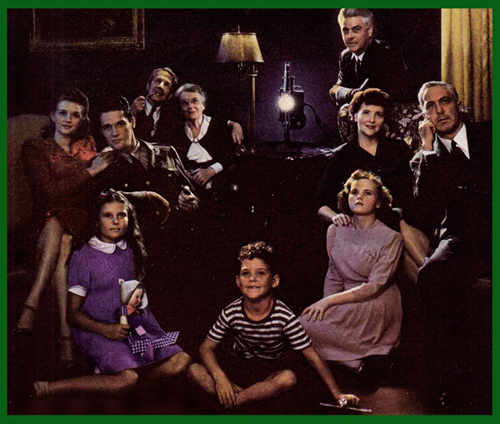 It's all about OLD MOVIES! (quite a show in itself nowadays). THERE'S A SPECIAL MAGIC TO IT! How exactly does Excelsior take you to another time? 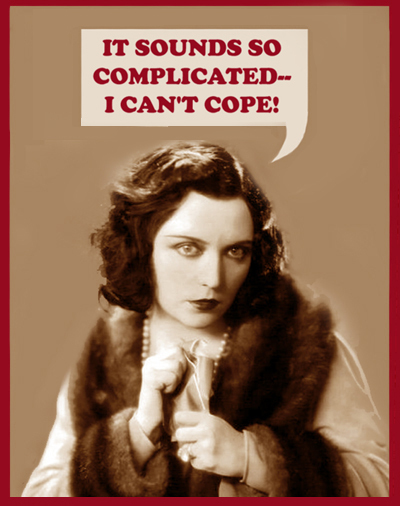 mindset, replacing your frame of reference with an Art Nouveau or Art Deco frame, so to speak. as a familiar place, as your own time. And that goes for 1906, 1917, 1928 or any other year. WAS, or Clara Bow WAS; Griffith IS, Pickford IS, Valentino IS, Clara Bow IS. Not to worry; Excelsior can be as simple as a projector and a screen. So Let Us Show You Some Nifty New Movies! to go and see movies, and some of them are actually still in existence today. machine that would take us back to the 1912 Mystic and its departed glories! next to the ticket window assuring us of "A New Show Today". And what a show it was! of any part seem to have survived. The 1927 feature of the same title is also a lost film. poster coverage, as befits Roscoe 'Fatty' Arbuckle's great popularity. Presumed lost. American Engineers and Daring Brigands at the Mexican border. Another lost film. Williams, who also co-wrote and co-directed this intriguing two-reeler. A lost film. 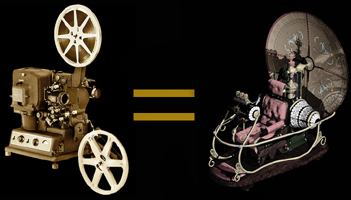 1914 as a split reel with "All for Love", featuring Romaine Fielding. Both presumed lost. 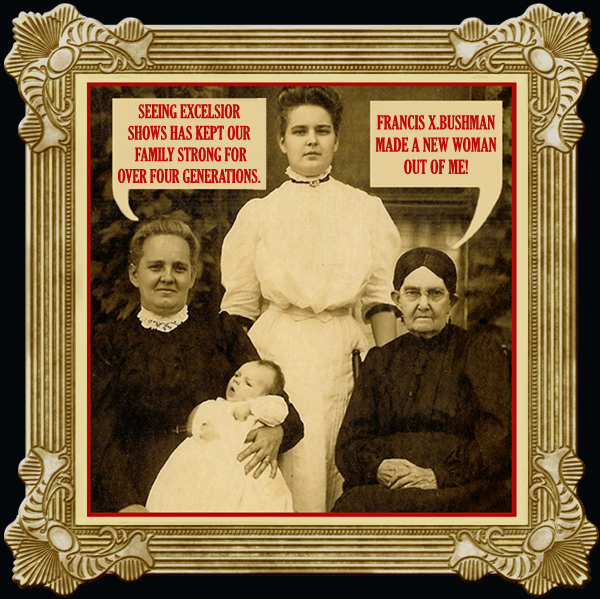 forward to announcing show dates in appropriate venues! Check back for updates. 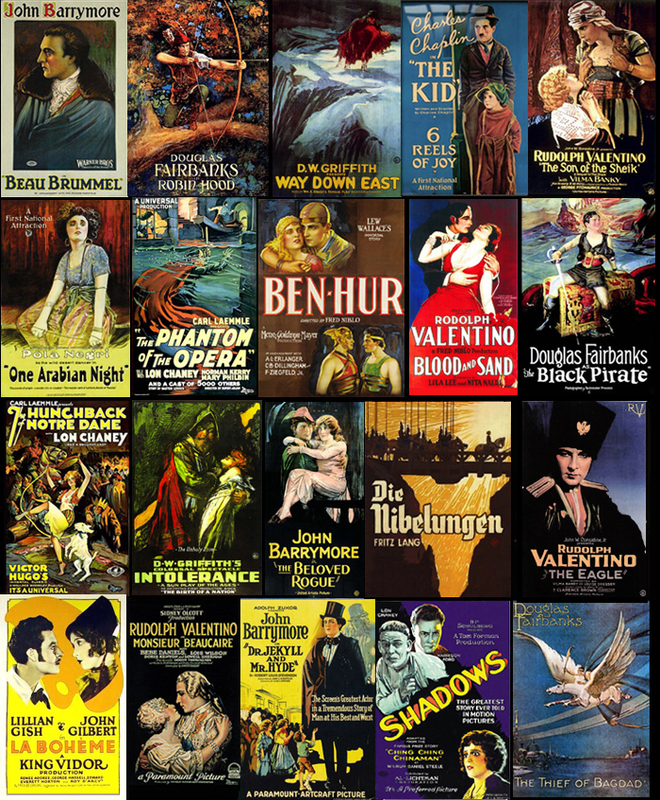 a more complete selection of the movies that were actually onscreen in the 1910s. jerky action. Dramas suffer more by it than comedies, but it's always regrettable. 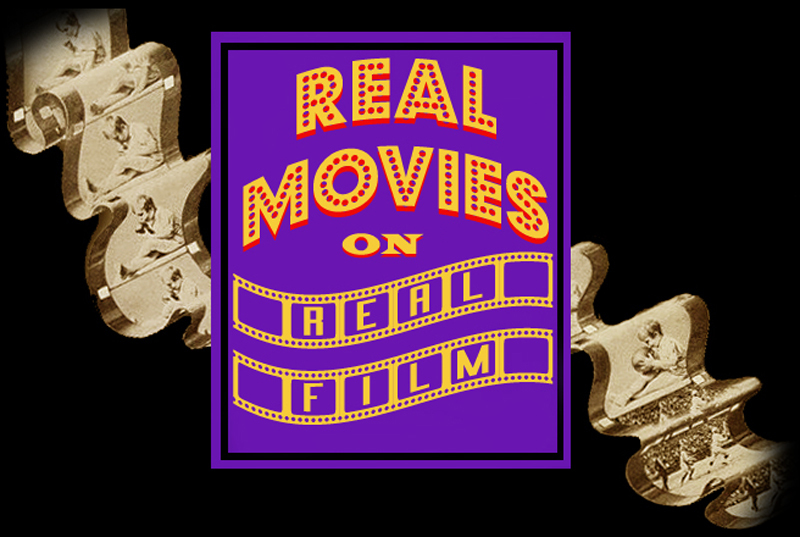 the films themselves suffer by it, and the audience's experience is less authentic. our moviegoers' period immersion by visible evidence of its presence at our shows. And We Especially Love Silents. and the advance of Feature Films and major movie houses. 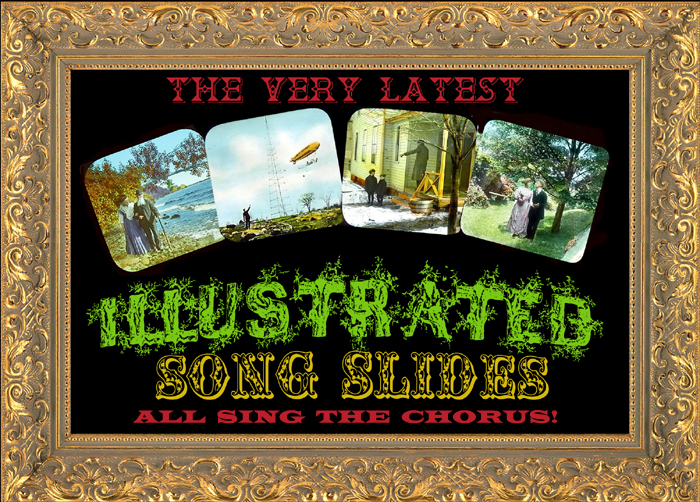 and Live Vaudeville, circa 1905-1915.
in any great quantity-- so we create our own on 35mm slides. 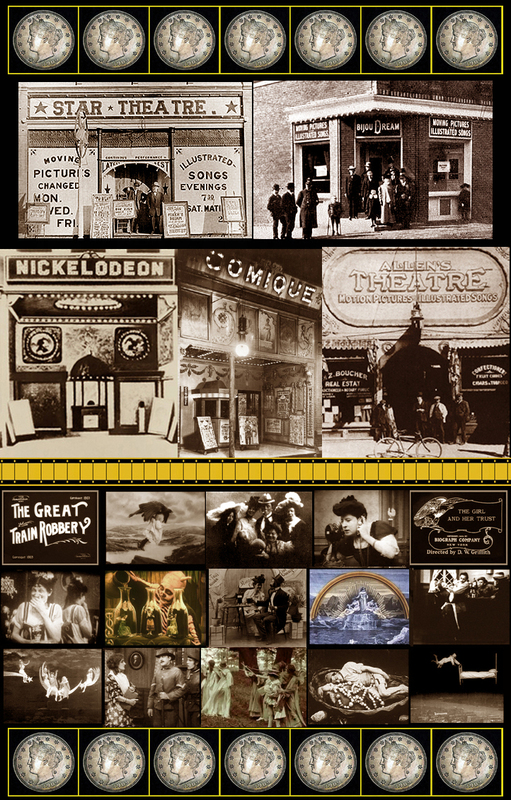 Some nickelodeons also featured small-time Vaudeville acts. Showcasing the Great Silent Stars and Directors. Make Fitting Appetizers for Our BIG PICTURES. that Excelsior strives to emulate. "THINGS TO COME" enlarges upon this theme. 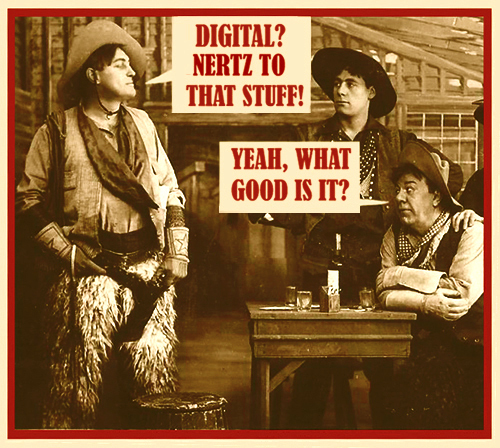 OUR SILENT FILMS MUST HAVE MUSIC! musical talents to be found in the Greater Bay Area today. for even the most lavish of cinematic epics. to comedy shorts, songs and novelty acts. 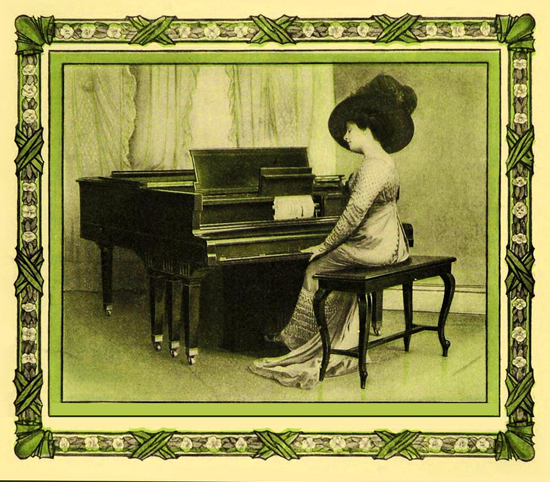 will animate the ivories with artistic aplomb. or church or museum or community center or rented hall or club, or you name it. performance venues like any act. We're based less than a hour north of San Francisco. badly in need of restoration. 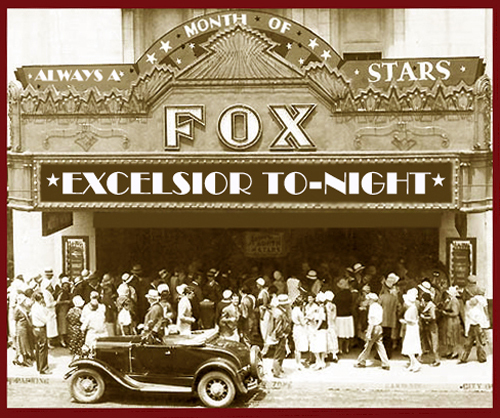 The Excelsior Company's mission is to present old-time films in the context of their times. 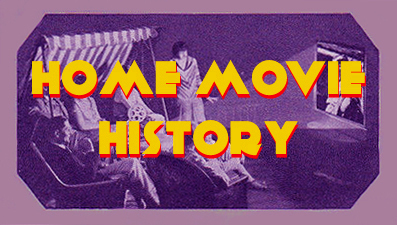 It's history, it's entertainment & art, and it's entertainment & art history. the viewer to that other time when each film was new. and the piano can also be a nice feature for talkie shows that include appropriate live entertainment. 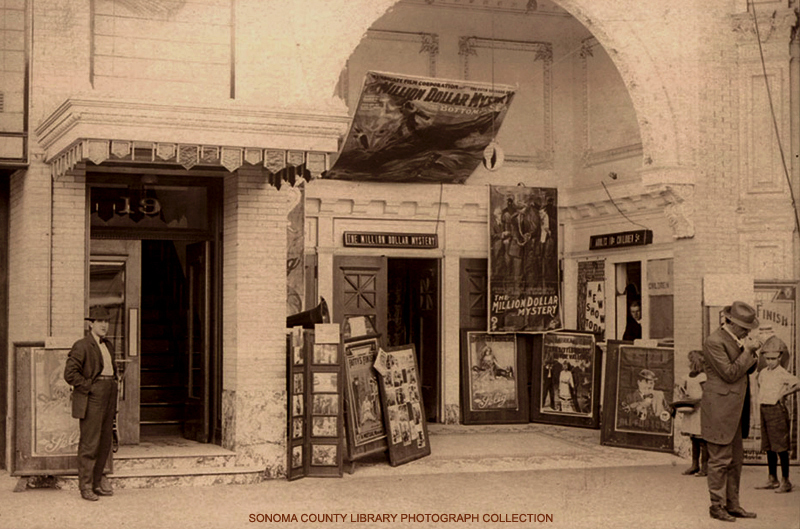 and even modest vaudeville turns, as was the fashion in these early multimedia shows. a practice continued well into the sound era by the major houses. whether the intent is to provide pure old-time fun, or to instruct in a fashion as agreeable as it is memorable. past movie eras, with their special flavor, charm and significance. COME PLAY IN THE PAST! 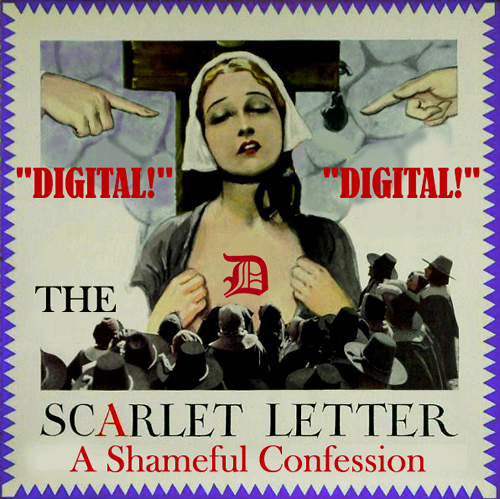 Apologies-- our email buttons stopped working. But you can EMAIL to ExcelsiorShows@aol.com.